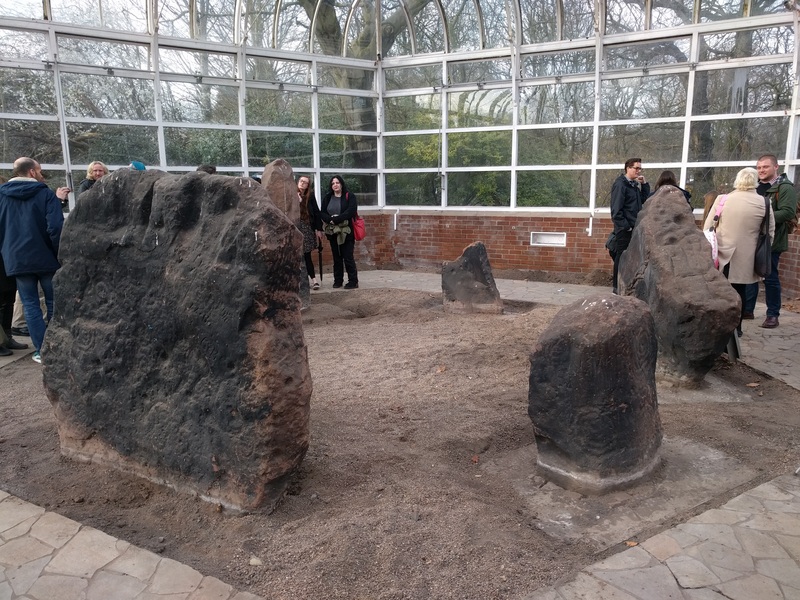 Over a month back, at the start of April, Lela and I went to Liverpool for John Reppion‘s Spirit of Place conference, a site-specific event linked to the Calderstones, a group of standing stones in a Liverpool park. 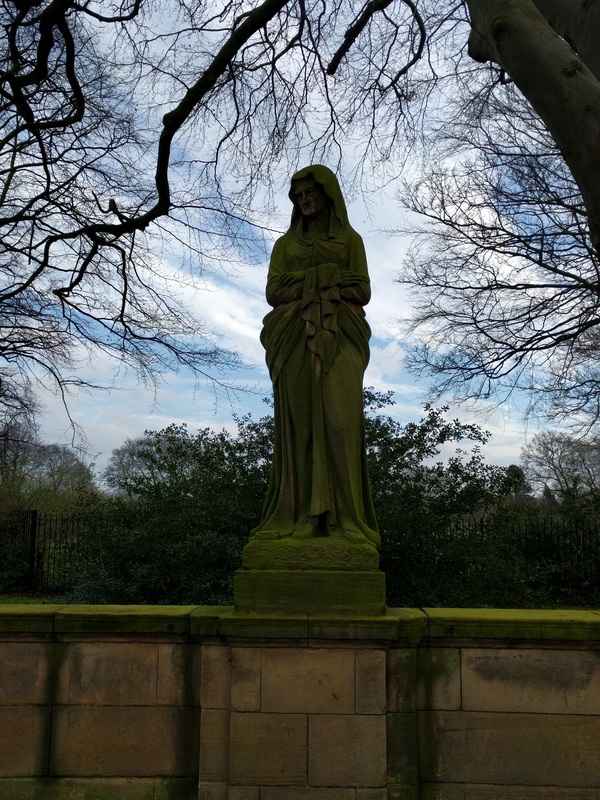 I don’t know Liverpool well – I last went with my Dad and sister back in the nineties. But the list of speakers was so interesting that I thought it would be worth the trip. John Reppion described the event as something “people who live in London, or Brighton say, might be quite used to seeing advertised but which there never seem to be very many of up here in the North.” Brighton could definitely do with events like this one. The day brought together a range of speakers, including archaeologists, psychogeographers, historians (an epic description of the wrecking of the RMS Tayleur), artists (a premier of short film The Menhir Motorway) and a magician. The sessions were incredibly inspiring while avoiding a game of psychogeography bingo, and I wanted to note down some of the things that I responded to. I came out of it fizzing with ideas, and things to follow up. Kenneth Brophy (AKA The Urban Prehistorian) gave a fantastic talk on ancient monuments in cities and the response of local people. 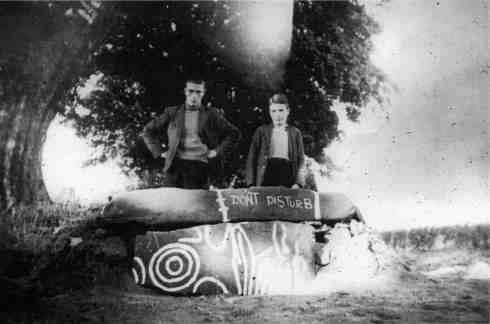 He talked in particular about the Cochno Stone, which was buried to protect it from locals, mentioning the shame many felt at not being trusted with the monument. We also saw examples of how prehistoric monuments in cities are often fenced off, producing the strange spectacle of caged standing stones. Personally, I’m still disappointed that Silbury Hill was inaccessible. With the Cochno stone, there are plans for a replica to be made and placed above it. May Miles Thomas has produced a short film, Cochno Stone Revealed. Richard MacDonald worked as Heritage Story Maker, which is the best job title I’ve ever heard. If I knew that was a possibility, I’d never have become a programmer. It was good to see Cat Vincent talk again. When he announced that he was a practising magician, someone in the audience gasped ‘Oh wow!’. His talk, Where the Buddleia Grows made the point that when most of the world’s people live in urban areas, magic should not continue to privilege the rural above the urban. He also discussed how people say that history repeats itself, then suggested geography does not repeat, but it rhymes. He spoke about his own connection with buddliea, the ‘bombsite flower’. which often grows in the city. It was a lovely talk and well worth reading via the link. The final session was an interview with horror author Ramsey Campbell. It was fun to listen to someone I’d been reading for about 25 years, since I used to borrow Best New Horror collections from Harlow Library in the 90s (that shelf of horror was probably the only good thing about that town). Campbell talked about his connections with the local area, the shop where he first discovered Lovecraft, and about Bartleby the Scrivener as horror. His latest book is based on the folklore of Liverpool. He claimed that he’d made notes of ideas among his research and now was no longer sure which parts he had made up. It was good to visit Liverpool, even if we didn’t have a long time there (we did our best to visit the Tate in 30 minutes, and made a fairly good go of it). We also stayed in a Beatles-themed hotel, with a night-manager who’d never been to the top floor until he showed us to our room. Terrible breakfasts, but fun decor.